I am not a woodworking scholar by any means. I do not have an extensive collection of woodworking tomes. Generally, if I can't find an answer, or a lead, to whatever question is being researched in the first sixty hits on Google, I figure it must be too obscure for regular folks like me. Not too long ago I was researching the use of the lowly chisel roll. Often I have read advice that chisel rolls should be used to protect, carry, and store tools. However, I could not find much, or any, real advice on HOW to use a chisel roll. Generally the unanswerable questions around tangible things revolve around two concepts. First, is that the use is so blindingly obvious there can be no directions; think clothes pins, or tooth picks. The second concept is that the thing must be so prone to personal interpretation that forcing a way of using it is futile. The organization of a man's wallet illustrates this second point nicely. Personally, I never put actual money in my wallet. I assumed that the chisel roll fell into the blindingly obvious camp. However, my research has revealed that chisel rolls actually fall into the personal preference camp. The above chisel roll took around ten hours to make. Most of that time was for the hand stitching. The design phase took far longer simply because I wanted to make the roll right the first time. The major question is organization of the roll. Are pockets used handle first, or blade first? Do blunt tools go outboard, or do sharp tools? When I first started down this path, I figured it would be a ten minute trip at most. I was wrong. Chisels are more secure during transport. Reasoning is that the handles are almost always wider than the steel part of chisel so when wound and tied the roll is thicker at the ends. Nobody really opined about blunt vs. sharp tool placement. I guess that question was a red herring I set myself up for. I couldn't find any general consensus, so I thought I'd ask woodworking professionals for their thoughts on the matter. After all, they are the definition of modern shop practices, right? I sent queries off to notable folks whose work I admire for whatever reason. To my surprise, I got some responses! However, I started, and finished, construction based on what I think a chisel roll should be before hearing from any of the masters I queried. I went with staggered pockets per the norm in tool rolls with the handle in the pocket. It was more important to me to see the blade profile and I figured they would stay put better. Glen Huey of 360woodworking.com doesn't spend much thought, or time on chisel rolls. Glen says "The only tools I have packed in my rolls are carving chisels, which I store with the handles in so...I can see the chisel design and size". In typical Glen succinct fashion he closed his advice with "Wish I had some earth-shattering spiel to pass along, but ...". I have to respect such a pragmatic approach. Jeff Miller pretty much echoed Glen Huey with his views. "I do put my chisels in blade first. I usually pull all of them out when I'm working". However, Jeff only uses tool rolls when on the road; they are racked when in his native shop. Jeff's final words of advice pretty much sum up my trip down the chisel roll rabbit hole: "Don't go too crazy with this! Chisel use is far more important". Famous wood carver Mary May also responded to my inquiry. There are four woodworkers who I watch intently whenever I get a chance to see them at a bench: Frank Klausz, Ron Herman, Roy Underhill, and Mary May. The economy of movement, the adroit placement of tools with purpose, and movements so honed into muscle memory that they could never vocalize the skill they display are the chief reasons I observe what they do so intently. Also, I always watch from afar for fear of creeping them out. :) Also, also, no disrespect intended for Jeff, or Glen. I've not had much chance to see Jeff in action, and Glen is so darn fast you feel sure fingers and toes are going to fly off in some random direction. Being a woodcarver, I value Mary's opinion above the others simply because chisels are her primary tools. Always. Like Jeff, Mary only uses rolls when traveling--and prefers (Levi's) denim over leather any day. Here is Mary's basic take on the chisel roll: "Tool handle in pocket. They hold tighter and don't fall out. You can view your tools without removing them all. Less likely to cut your tool roll by putting them in blade first. Be careful because this is about the only time I cut myself - putting tools in and out of the tool roll". Mary's parting advice from, I'm sure, extensive experience is also very practical. "Don't store tools in roll for a long time - especially in humid environments". At long last we arrive at an awesome tool roll that will probably never get used! I don't travel with my woodworking. 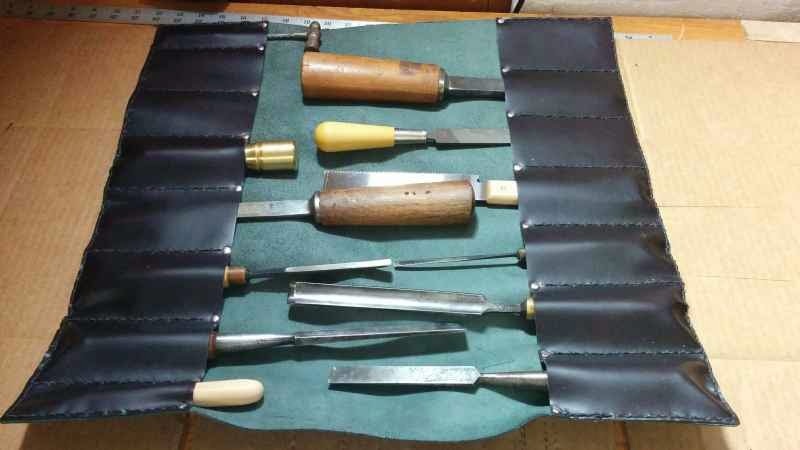 I built the tool roll to house tools I don't use often, yet the experts all agree that long term storage--especially in leather--is a bad idea. I wonder if coating the leather surface that might touch metal with mink oil would help? It waterproofs my boots, right? This post is already too long, so I will do another detailing the very simple construction of the chisel roll. Best wishes for a prosperous and healthy 2015 to everyone!